the xray doctor: xrayoftheweek 6: what does this bone scan tell you? 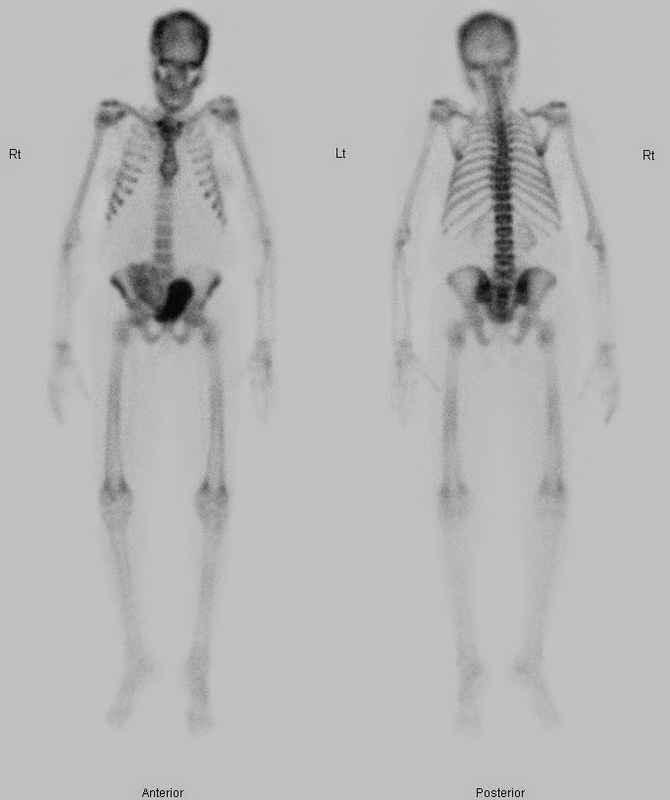 xrayoftheweek 6: what does this bone scan tell you? This is the nuclear medicine bone scan image from a middle aged man. What are the salient findings and what is the diagnosis? The bone scan shows increased tracer uptake at the end plates of the vertebral bodies, but not involving the whole of the vertebral body at any level. There is uptake relating to degenerative change in the shoulders and knees but no pathological uptake elsewhere. Note the presence of kidney-shaped uptake in the right side of the pelvis. The endplates of the vertebral bodies have an increased density, giving rise to alternating bands of increased and normal density, like stripes on a rugby jersey. This is why this appearance is called the "rugger jersey spine". There is a kidney visible in the pelvis, which is a transplanted kidney. This is renal osteodystrophy. Chronic kidney disease leads to metabolic changes with abnormal bone turnover and mineralisation. There is characteristic increased bone density at the vertebral endplates, secondary to increased osteoblast activity. 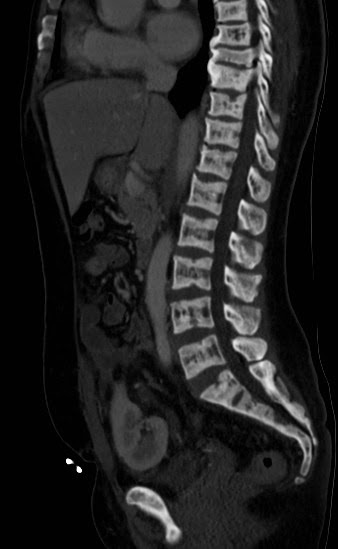 This leads to alternating bands of increased and normal density on plain films and CT of the spine, and alternating bands of increased and normal uptake in the spine on a bone scan. These bands are likened to the stripes of a rugby jersey. For FRCR 2b candidates, the "icing on the cake" with this film is to see the renal transplant and give the answer of renal osteodystrophy in someone with CKD and a renal transplant.